A coalition of CEGEP student associations is calling on the Coaliton Avenir Quebec government to re-evaluate the need for a third bridge or a tunnel between Quebec City and Lévis. A coalition of CEGEP student associations in the Quebec City region is asking the Coalition Avenir Quebec government to study the environmental impact of a third infrastructure project crossing the St. Lawrence River. Hundreds of students and citizens gathered in downtown Quebec City on Saturday to voice their opposition to what is being called the "third link" between the capital and Lévis, on the south shore. During the election campaign, François Legault promised the project would break ground within his first mandate. The CAQ ended up winning eight of the region's 11 ridings. Despite those results and a widespread support for the project among a segment of the population, Noémie Veilleux, one of the organizers of the march, said "it's not too late to get informed." The CAQ campaigned on the promise to alleviate traffic for commuters driving in and out of the city. She said that citizens should seek out information about the real impact that putting down new road infrastructure would have on traffic, and on greenhouse gas emissions. March co-organizer Émile Gendreau-Côté said that building new roads to reduce traffic was an archaic vision of urban planning. "We've seen it since the 1960s — we add roads and roads and there's still traffic," he said. He hopes more and more people will turn to public transit and consider the benefits of the $3-billion tramway network expected to be running by 2026. "It's an alternative we have to embrace in the present context where climate change is becoming more and more urgent," said Gendreau-Côté. The voices of those in favour of the project have been amplified under the new Transport Minister François Bonnardel, who has set his eyes on building a third link east of the downtown core. Last week Bonnardel announced that a full-time staffer would be tasked with reviewing the potential routes, and managing the $20.5 million the Liberals had promised to set aside in their last budget. The CAQ now wants the blueprints to include a plan to refurbish the Île-d'Orléans bridge. 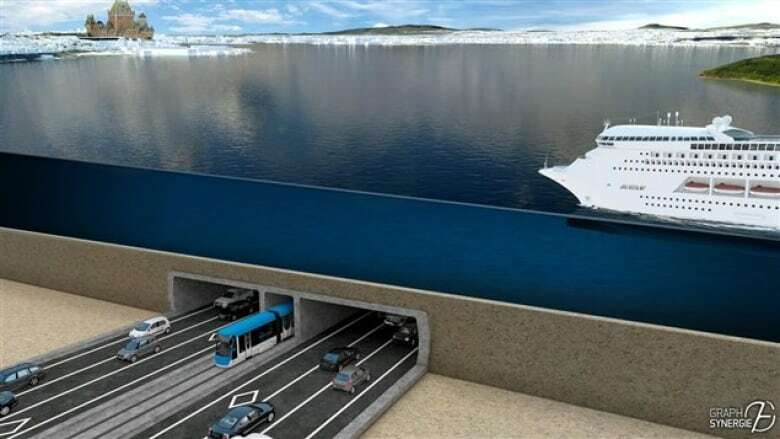 The last feasibility study ordered by the government in 2016 estimated that a 7.8-kilometre tunnel running just west of the tip of the island would cost $4 billion. Quebec City Mayor Régis Labeaume — who has never fully supported the third link project — seems to have resigned himself to the idea, stating on Nov. 1 that "Legault was elected because of that." "I can't really see myself fighting for [a link to the west] now," Labeaume said. 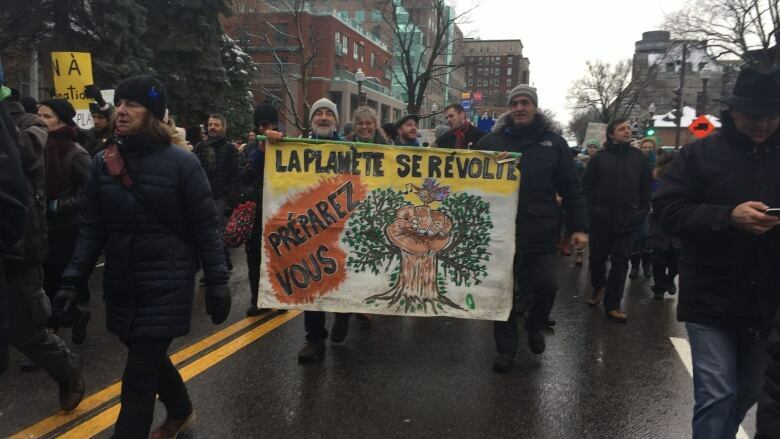 The march came in the midst of a string of rallies across Quebec on Saturday asking the CAQ to put in place policies respecting the environment. "When he was first elected, François Legault said the environment was a priority for him, this is his chance to prove it," said Veilleux. People gathered to voice that sentiment in Montreal, Trois-Rivières and a dozen other municipalities across Quebec this weekend. Earlier this week, 500 prominent Quebecers — including artists, businesspeople and researchers — signed their names to a document to pledge action on climate change, called Le Pacte pour la Transition, outlining a number of measures they commit to making as individuals to reduce carbon emissions. With files from Radio-Canada's Fanny Samson.